Here's the thing; our engineering rates aren't always the cheapest at first glance (neither are they the most expensive) - but ...we are the specialists - and most customers end up saving money when they use us. Resellers often come to us for their most problematic HP Designjet printer repairs, so you can be absolutely assured we'll do a great job for you, in the fastest possible time. Our customers find that we are professional, knowledgeable and cost-effective - and stick with us once they find us. Our parts prices are extremely competitive and we offer a great all-round customer service. 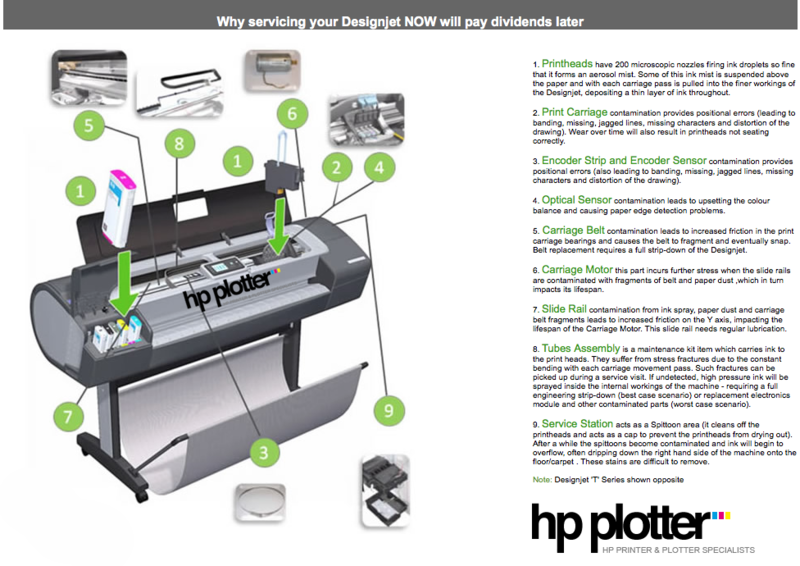 Our Designjet and Laserjet engineers are HP Trained and Qualified and we also undertake warranty work on behalf of HP. 2. Reply to the emailed estimate and click the link provided to book your job in! 3. You'll receive an email confirmation with an ETA. Payment will then be arranged with you. Simply call 01256 783390 or email engineering@hpplotter.co.uk with any questions. Our engineers are all HP Designjet trained and will attend your site with spare parts; our key aim is to get you up and running quickly, with less down-time. 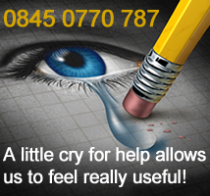 We'll also offer you free impartial advice if we don't think a printer repair is viable for you. When you ask for a Designjet repair (or Laserjet repair) estimate we'll quickly tell you the costs 'up front', covering callout fee, hourly rate, estimated time on site and probable parts required - so there are no nasty hidden surprises. Not only can we provide professional service and repairs, we can de-install/re-install your large format printer for office moves, unpack and install new Designjets, offer basic user training to your team and teach them how best to use the plotter and carry out basic maintenance to ensure trouble-free operation and reduced breakdowns. You can expect your Designjet to be fully serviced/cleaned/inspected and recalibrated with every repair visit. Our in-house apprentice engineer Tristan also won the UK Print Hottie Award 2013 - so we're a good looking bunch too (...apparently!). Tips to get the best engineering result! You'll need sufficient ink, printheads and paper for the engineer to carry out test prints - or we can supply them (at good prices!). The engineer needs enough space in which to work, and adequate light and power. Gush and tell us the whole problem at the outset - don't withold anything. Do try to be as accurate as you can when describing your printer issue - if you say it 'just needs a service' but you know it's been juddering and powering off intermittently' or has a 11:11 error code, then we are unable to gear up for parts required and may have to revisit. On the day of the engineers visit, be sure you are available and notify us immediately should you need to cancel or reschedule the visit. Do be on-site while the engineer is working and don't be afraid to ask questions or request more test prints - he will be happy to oblige. A nice cuppa is always appreciated! There you have it in a nutshell, painless wasn't it? Very good service. It is much appreciated! How quickly can you come out? If we don't need to ship parts then sometimes same day. If we need to ship parts then it depends if you're happy to pay for a timed delivery service which will allow for parts to be despatched as soon as we receive your order - and then arrive with you by the following morning. In this case our engineer can often attend in the afternoon. Most people opt to pay for the standard 'Next Working Day' delivery - in which case we'll arrange for the engineer to attend the day following delivery of parts. If you are a Support Contract customer you will be guaranteed a Next Working Day attendance - so all Contract Customer calls will receive priority over Adhoc Repair customers. If you do not have a credit account with us then we will require cleared funds prior to the engineer attending site. Payment can be in the form of a cheque, BACS, CHAPS, debit or credit card payment. Cash can only be received at our Head Office in Hampshire and while we will happily accept cheques, you will need to wait until your cheque is cleared before we attend site. Is your engineer a local engineer? Will your engineer have inks on him? Generally the engineers don't carry consumables in their van stock (such as ink, paper and printheads) because customers normally have sufficient supplies of ink and paper to allow test prints to be carried out. If however you wish to organise replacement inks/printheads/paper then please either order online or let us know (and we will be happy to despatch your consumables order prior to the engineer attending site. You've estimated for parts - but how do you know it needs them? We estimate parts based upon our past experience of dealing with the same error code - as well as HP's Engineering Handbook. Parts are assigned simply to try and ensure that we get you up and running as quickly as possible. Any parts that aren't used will be removed from site by the engineer and you will not be billed for these parts. Do you use original HP parts? Yes - we only use original HP spare parts, inks and printheads. We do however use refurbished parts when the machine is obsolete and parts are no longer manufactured or available so that we can assist those customers who wish to maintain old machines that have been obsolete for many years. I already have the part - I just need you to fit it? That's fine - we can bill you for the callout and labour and our engineer will be happy to fit your parts for you. Can I buy a Support Contract instead of paying for a repair? A Support Contract is designed to keep your printer in the same condition as it was at the start of the Contract, for the term of the contract. In short, if you have a fault with your printer you will need to have it repaired first and then go onto a Support Contract afterwards. It's a little like car insurance where you can't take out insurance 'after' an accident has occurred, to protect you from a repair bill. However the good news is that on our Support Plus Contract, which includes an annual service visit, we are happy to use this visit to come out and repair your printer at the start of the contract. The main point here though is that if your printer requires replacement parts - or if we are longer than 1 hour on site (or if the repair requires a revisit) then any extra time on site is billable. This will also provide you with cost saving 'over and above' opting for a repair followed by a Standard Contract and it will also enable you to have 5% off all consumables. What are all of your Service and Repair options? What type of Designjet repairs can you carry out? We will cover every issue with your printer; tell us about your error codes, error lights, paper jams, damaged or broken parts, black bits of the carriage belt dropping on the printer platen, paper feed issues, grinding and clunking noises, juddering, smudges, printer jamming, not cutting, printing a few lines and then stopping, looking like it's printing with no ink coming out, damaged spindle, warning lights, no power, ink smears, ink leaking, printing blue not black, green tinges on greyscale, shadowing and ghosting, ink and printheads not being accepted even though they're brand new, 86:01 errors, 11:11 errors, 79:04 errors, 05:10 errors, insufficient memory errors, 21:10 errors, ink spraying up the wall errors, the big bang, billowing smoke and while we're at it we'll throw in water damage...to name but a few! What makes you the best choice? We specialise specifically in Designjet and Laserjet repairs. We don't need to spend hours trying to analyse/pinpoint undocumented Designjet faults (many faults and some error codes aren't in the HP Repair manual!) - we've been through the loop many times before and you get the benefit of our many years of experience. This means that we carry out repairs faster providing a cheaper bill at the end of the job than companies who undercut us (but then spend twice as long on-site trying to do the job, and not always so successfully). Designjets are a different breed of printer. We also have a warehouse of Designjet spare parts. It's one of the largest in the UK and we hold many thousands of spare parts, for both new and obsolete models (including the Designjet 450, Designjet 500, Designjet 1050, Designjet 4000, Designjet 5000 etc.). 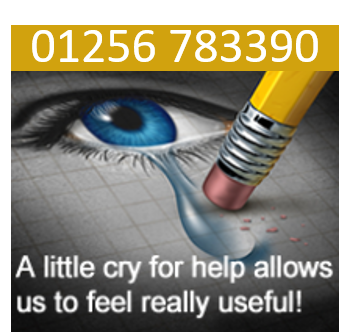 This means that we can draw upon our stock to quickly resolve your Designjet faults and get you back up and running. By comparison many HP spare parts (subject to availability) have a 7-10 day lead time. This is important if a fast repair is critical to your business. Finally we are HP preferred partners and are acknowledged by HP as specialists in our field. We also support HP with warranty repairs.